Turn your Instant Pot (or other electric pressure cooker) to the sauté or brown function and allow it warm slightly. Add the ground beef and cook with the lid off, stirring frequently, until it is no longer pink. Drain anyway any grease. 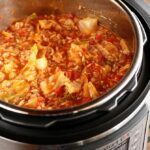 Add the onion, garlic, tomatoes with the juice, vegetable juice, beef broth, rice, and cabbage and stir to combine. Add salt and pepper to taste. Put the lid on the pot and set the steam vent to "sealing" or seal. Set the cooker for 15 minutes on high pressure. Once the cook time has finished, carefully use the quick release function to allow the steam to escape. Taste for additional salt and pepper. Serve immediately.